"When it comes to senior center backs, there are none more accomplished than Marwede, who has the chops to do just about anything you need of a center back in the middle of the park. Her size is the most obvious facet about her game, but there’s considerably more to it than that. 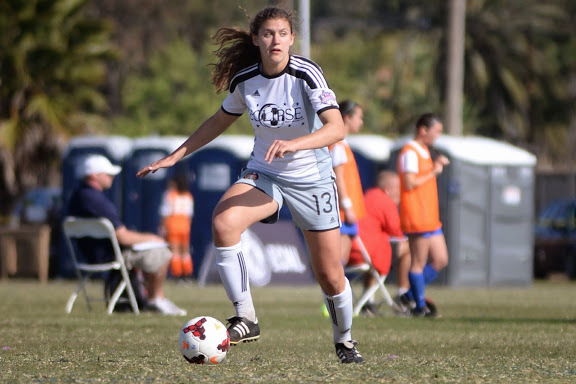 This Eclipse side prefers to play it out of the back as much as possible, and after winning the U16 national championship in 2014, Eclipse made it back to Richmond for the ECNL Finals again in 2015 (and finished third in their group). "Marwede’s leadership from the middle shouldn’t be overlooked. She has pillow feet for her size, and if French decides to mix it up and go more along the ground, she won’t find a better mix of aerial and on-the-ball skills than Marwede. A perfect option either off the bench late as a dead ball threat in the box or simply as the main option in the middle. Her height isn’t to be missed." For the full article, visit TopDrawerSoccer.com. New York Red Bulls II forward Stefano Bonomo comes from a line of top-level athletes in his family. Bonomo’s father Paolo, as well as his grandfather who he had never met, were former professional skiers. Paolo represented Italy’s national ski team, so between his skiing days and devoted interest in his son’s line of work – coaching for a portion of his youth days – Bonomo says he has had the type of tutelage that many others do not have the privilege of receiving.